Wary yet pugnacious, the Eastern Comma ranges north into Canada like the Question Mark, but not as far south into Florida. There is a modest range difference within Massachusetts: the Eastern Comma is scarce in southeastern Massachusetts, and Cape or Islands, whereas the Question Mark is common there. Eastern Comma prefers the kind of rich, moist deciduous forests which are not found on the coastal plain. In other respects the two species are quite similar, sharing many host plants and habitats. The Eastern Comma was known as the Hop Merchant in the 19th century, though the Question Mark could equally qualify for this title. Hop growers (who were evidently quite familiar with Question Marks and Commas) took the gold flecks on the chrysalis as a sign that hop prices would be good that year. The Eastern Comma and the Question Mark were both readily findable in 19th century Massachusetts. Scudder notes that “numerous collectors” had found it in the Boston area, and that it had also been found in Amherst, Holyoke, Granby, Springfield, and Williamstown (1889: 338). Sprague collected 14 specimens in Wollaston (now Quincy) in April 1878, and one in Belchertown in July (Sprague 1879). Thaddeus W. Harris at Harvard was the first to describe this butterfly. His early notes regarding his 1820-26 Boston area collection show a specimen (#564) labeled Vanessa c-album; this was the name of an Old World butterfly, but by about 1826 Harris was beginning to think that he might have a different species. At first he thought it might be Polygonia progne (Gray Comma), but after 1830, when he had collected adults of progne, he noted in his Index that whereas up to that point he had “confounded” P. comma with P. progne, now he was sure of the difference (Index 1820-1850; Calhoun 2009). His Index to his 1820-1850 collection lists Eastern Comma specimens from Sept. 1, 1827, May 1, 1828, “from pupa July 15, 1829,” and Sept. 10, 1841 (no locations). Three of these four specimens are still in his collection; the fourth is presumably Type #26345 in the MCZ Types Collection. Eastern Comma was widely collected in eastern and central Massachusetts and the Connecticut River valley in the late 19th and early 20th centuries.. In addition to the locations mentioned by Scudder, Sprague's specimens from Wollaston, West Roxbury, Malden, Braintree and Deerfield are in the MCZ, along with others from Walpole, Waltham and Wellesley. Farquhar (1934) mentions the additional locations of Framingham and Princeton in Worcester County, and Holbrook, Beverly, Rowley, Cambridge and Lynn in the east. At Yale Peabody Museum are F. M. Jones' specimens (4 Aug. 1946 and 3 Aug 1948), from Martha's Vineyard. It was collected in the Berkshires in the 1980's (Yale and MCZ). William H. Edwards was the first to demonstrate the seasonal dimorphism of both Eastern Comma and Question Mark. In the 1870s he confined females on the host plants, and produced the two different forms, summer (black hindwings), and fall/spring (reddish-orange hindwings), showing that they were actually different broods of the same butterfly (Sorrenson 1995: 221-2). Eastern Comma’s most frequently-used host plant today may be Stinging Nettles (Urtica dioica), but it also uses Hops (Humulus lupulus), Wood-nettle (Laportea canadensis), and American Elm (Ulmus americana). The 1990-95 Connecticut Atlas found it ovipositing on each of these four hosts in the wild. Photographer Sam Jaffe has found the caterpillars on elm in Massachusetts (Jaffe, masslep 6/1/2011), and MBC members have often found and raised them on stinging nettles. It probably also uses False Nettle (Boehmeria cylindrica), but does not thrive on or usually use hackberry (Scott 1986). There is much overlap of hosts with Question Mark, although the latter uses hackberry, and is not known to use wood-nettle. Wood-nettle and elm were its likely native hosts before the arrival of European settlers. Like the Question Mark, the Eastern Comma’s original habitat was no doubt forest openings and early successional areas with elm or wood-nettle. The Eastern Comma is more closely associated with rich deciduous woodlands than is the Question Mark, and it is less frequently found away from woods. But it uses the canopied woods mainly for hibernation and aestivation, and needs sunlit openings with nettles, hops or elm saplings for reproduction. The Eastern Comma probably declined as a result of the forest clearing in the 17th, 18th and 19th centuries (Table 1: 1600-1850). However, as with the Question Mark, the retention of elms as yard and street trees, the spread of nettles, and the cultivation of hops were mitigating factors, helping to maintain this species even through the subsequent periods of urban and industrial growth. Eastern Comma probably also benefited from the re-growth of forests outside of urban areas after 1950. Eastern Comma’s quick adoption of non-native stinging nettles and hops in addition to its more traditional woodland host plants was an adaptive behavior which contributed to its survival. 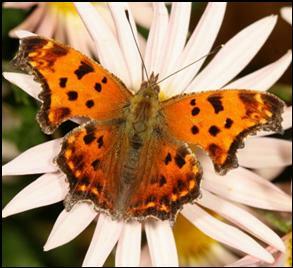 Eastern Comma is listed on Table 3 “Switchers” as among those species which have added new host plants to their diet. According to Scudder in the 19th century, among the Eastern Comma’s several host plants, hops appeared to be “the favorite” (1889: 338-9). Non-native stinging nettles are now fairly widespread in disturbed open areas. Hops are not as common, but are found in many woodlands (see account under Question Mark). There may be a variety called American Hops which is native to a few Massachusetts counties, but Common Hops (H. lupulus) is not native to any county in Massachusetts (Dow Cullina et al., 2011), and likely was introduced from further south in the 1700s, grown for beer production, and escaped to the wild. Elms are native to all areas of the state except Cape Cod and the islands; in these areas elms have been introduced (Sorrie and Somers 1999). Everywhere, mature trees were much more common prior to the 20th century. Elms are still fairly common, but Dutch Elm disease prevents maturation beyond the sapling stage. Luckily, the Eastern Comma and Question Mark use the saplings rather than full-grown trees. The 1986-90 MAS Atlas found Eastern Comma in only 70 of the 723 blocs searched, yet still termed it “common.” If number of blocs seen had been used a measure, it would have been ranked as Uncommon. MBC records 2000-2007 rank it as Uncommon-to-Common (Table 5); it is reported somewhat more frequently than the Question Mark, which ranks as Uncommon. MBC sightings per total trip reports, shown in Chart 50, show a pattern of increase over the 18 years 1992-2009. In addition, the important list-length analysis of MBC data, published in Nature: Climate Change, also found a statistically significant 104.4% increase for Eastern Comma 1992-2010, in contrast to a 48.9% decline for Question Mark (Breed et al. 2012). Statistics published in the MBC Massachusetts Butterflies season summaries also show the increase in recent years: the average number of Eastern Commas seen on a trip was down 8% in 2008, but up 98% in 2009, and 42% in 2010, compared to the average for preceding years back to 1994 (Nielsen 2009, 2010, 2011). In contrast, Question Mark shows a percentage decrease in 2008, 2009 and 2010 compared to the average for prior years, although Question Mark numbers show great variation year-to-year. 2004 was an exceptionally good year for Eastern Comma; they had a “great showing” (Nielsen 2004 Season Summary, MB 24: Spring 2005). The season started with one of the earliest sightings known, on March 2 in Sudbury, and there were several especially high counts, for example, 18 on Mount Greylock 7/11/2004, B. Benner et al, 14 at Adams Greylock Glen on 7/17/2004 E. Nielsen; and 14 at Harvard Oxbow NWR on 7/18/2004 T. Murray. But by the year following this outbreak, Eastern Commas were back to their more usual abundance levels. From 1991 through 2009, Eastern Comma was found in 162 of the state’s 315 towns (Map 50). The years 2010-2013 add 17 more towns. 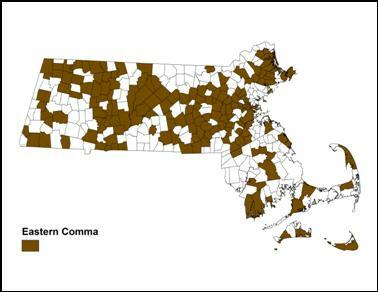 Eastern Comma is well-distributed across the state, except that it is less common in the southeast. Map 50 shows all towns from which there has been at least one Eastern Comma reported. It shows that Eastern Comma is not absent from the southeastern towns, although the numbers reported are low. Eastern Comma has been recorded in good numbers in almost all years on the following NABA Counts: Northern, Central, and Southern Berkshire, Central Franklin, Northampton, Northern Worcester, Northern Essex, Concord, and Blackstone Valley. It is infrequent to lacking on the counts in the southeastern part of the state. For Martha’s Vineyard, Eastern Comma was "rarely seen" in the 1940's, with records only from 1929 and 1939 (Jones and Kimball 1943). There are 1946 and 1948 specimens in the Yale Peabody Museum, collected by F. M. Jones. Today Eastern Comma is occasionally reported from Martha’s Vineyard, although not in great numbers (e.g. 1, 7/17/2011, M. Pelikan) and it has appeared on only one NABA Count there. There are several reports each from Chilmark and Edgartown, but the 2002 Vineyard checklist still lists Eastern Comma as “rare,” in contrast to the Question Mark, which is "uncommon" (Pelikan 2002). For Nantucket, there are a few historical reports from 1908 and 1939 (Jones and Kimball 1943). Today, Eastern Comma is probably an unlikely stray to that island, whereas the Question Mark is a breeding resident (LoPresti 2011). There is one MBC report of one Eastern Comma seen on Nantucket (10/1/1993, S. Bolton). The species has been fairly frequently reported 1991-2009 from one town on Cape Cod, Falmouth, (10 reports of 11 individuals), and lightly from other towns: Sandwich (1 report of 1), Truro (4 reports of 5), and Wellfleet (2 reports of 2). It is not regularly reported on the Cape NABA Counts. The Atlas had one report from Naushon Island. Mello and Hansen do not treat the Eastern Comma in their 2004 book on Cape Cod butterflies. In southeastern Massachusetts, Eastern Comma has been reported from Dartmouth, Fairhaven, Westport, Hull, and Halifax, but reports are few and never of more than 1-2 butterflies. One individual was reported on the Foxboro NABA Count in 1997, and 2 were found on the Bristol NABA Count on 7/19/2003. Adams (Greylock Glen max 14 on 7/17/2004 E. Nielsen); Andover (Ward Res TTOR max 4 on 4/16/2009, H. Hoople); Bolton (Bolton Flats max 4 on 7/11/2004 M. Lynch and S. Carroll); Boxford (Bald Hill (Crooked Pond) max 4 on 4/19/2004 D. Larson and 4 on 3/28/2009 J. Offermann); Conway (7 on 7/2/1994 D. Small); Easthampton (Mt Tom SR, max 17 on 4/14/2001 T. Gagnon); Grafton (max 5 on 3/29/1998 D. Price); Harvard (max 14 on 7/18/2004 T. Murray Oxbow NWR); Lee (October Mountain SF max 4 on 7/9/2004 T. Gagnon); Lexington (Dunback Meadows max 12 on 7/26/2001 M. Rines); Longmeadow (Fannie Stebbins WA max 15 on 8/13/2006 T. Gagnon and K. Parker); Milford (Purchase St Power Line max 3 on 6/16/2001 R. Hildreth); Milton (Fowl Meadows max 6 on 7/22/2009 B. Zaremba); New Ashford (Mt. Greylock, max 18 on 7/11/2004 B. Benner et al); Northampton (West Meadows max 4 on 9/20/2003 T. Gagnon); Northborough (Crane Swamp Trail, max 5 on 7/21/2007 S. Moore and B. Volkle); Northbridge (Larkin Rec Area, max 19 on 10/2/2003 R. Hildreth); Paxton (Moore SP, max 4 on 4/10/2005 T. Gagnon et al); Sherborn (power line, max 4 on 4/3/2008 B. Bowker; and Rocky Narrows TTOR max 5 on 5/23/2008 B. Bowker); Topsfield (IRWS, recent max 12 on 4/1/2000, F. Goodwin;) Uxbridge (max 6 on 6/19/2001 R. Hildreth); Westborough (MA Fish and Wildlife fields, max 5 on 6/28/2006 D. Price); and Worcester (Broad Meadow Brook WS max 13 on 6/3/1999 G. Howe et al). Warm spring days may bring out surprising numbers of Eastern Commas. On March 19 and 20, 2010, J. Berry saw 10 in Hamilton at Bradley Palmer State Park, on sap oozing from newly sawn logs, while B. Bowker saw 15 in Natick in Mumford Forest and another 15 at MAS Broadmoor Sanctuary. Eastern Comma has two broods, and a long flight period, from early March to mid-November (http://www.naba.org/chapters/nabambc/flight-dates-chart.asp). The ‘summer form’ brood flies from June through late August. The ‘winter form’ flies from early September to mid-November, then hibernates over the winter, sometimes emerging during warm spells, and then flies again early March through May. In species such as these (Eastern Comma, Question Mark, Mourning Cloak and Compton Tortoiseshell), which overwinter as adults, the first sightings in spring do not have the quite the same significance as for other species, since they are not emergences from pupae. The Eastern Comma, in particular, may just fly briefly on a warm winter day, then return to hibernation. Earliest sightings: In the 23 years of BOM-MBC records 1991-2013, the six earliest "first sighting" dates are 1/8/2013 Longmeadow, J. LaPointe; 2/16/2006 Stow Assabet River NWR, D. Holinger; 3/2/2004 Sudbury, B. Volkle; 3/7/2009 Canton Great Blue Hill, B. Cassie; 3/8/2012 Halifax, W. Petersen; and 3/8/2010 Andover Ward Res. TTOR H. Hoople. The exceptionally warm winter/springs of 2012 and 2010 are reflected in these records. In 17 of these 23 years Eastern Commas were seen in March or earlier, with most first sightings occuring March 24-27. Scudder (1889: 340) reported Eastern Commas flying all through March, so there appears to be little change in spring flight time since a century ago. If climate change results in warmer winters, an increase in January and February sightings might be expected. Latest sightings: In the same twenty-three years of records, the five latest "last sighting" dates are 12/4/1994 Foxboro, B. Cassie (also cited in the Atlas); 12/1/2006 Rockport, R. Heil; 11/23/2007 West Bridgewater D. Adams, 11/20/2011 Brookfield Quaboag WMA, M. Lynch and S. Carroll; and 11/20/1999 Milford R. Hildreth. Eastern Commas may be flying longer now than a century ago. Scudder (1889: 340) wrote that Commas become scarce by the end of September and “are rarely seen in October.” MBC records show many sightings in October (see flight chart). There has been no research on brood timings. In 2004-2006, Barbara Spencer, photographer in Cummington, found fresh "summer form" individuals to photograph beginning about 6/29, but they became "very worn" by 8/8. Fresh "winter form" individuals were found by 8/28 and even up to 9/20, becoming worn after that (pers. comm. 8/15/2011). It is important to note that Eastern Comma’s habitat consists of two parts: open areas with larval host plants hops, nettles, and elm saplings, and dense forests for hibernation and aestivation. NatureServe points out that Eastern Commas may “turn up in forests many kilometers from food plants,” and are presumably using the forests only for hibernation and aestivation. Thus it is recommended that both types of habitat be conserved for the species. Eastern Comma has a wide range across the eastern United States, including south to northern Florida and Texas. Climate warming may not adversely affect it in our state, but might at the southern edges of its range.